Recommended for children ages 2-5 years to enjoy any time of day. A focus on team-building, friendship, and working together: At last—here from the team behind the beloved international bestseller comes a companion to Goodnight, Goodnight, Construction Site. Down in the big construction site, all of the favorite trucks are back facing their biggest job yet and will need the help of new construction friends to get it done. Mighty, Mighty Construction Site teaches kids that when working as a team, even a big job seems small! They find out that with teamwork, nothing is impossible! The millions of fans of Goodnight, Goodnight, Construction Site are in for a mighty good time with the sequel, Mighty, Mighty Construction Site! 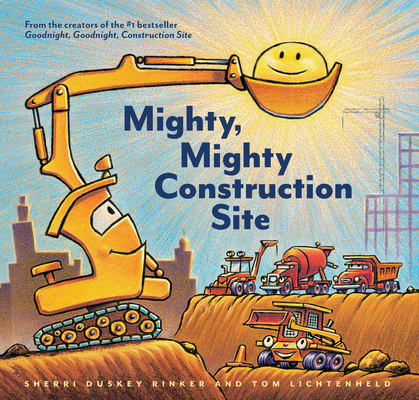 Recommended for young readers – and their construction vehicle loving grown-ups – to read and enjoy any time of day.